This book was so rich with story that it took me twice the time to read it as usual.I almost gave up at 50 pages in, because either it was slow or I was sleepy, but I’m glad I kept on! I ended up really enjoying it! I loved the author note at the back, which I read first. I knew this book was a retelling of Rumpelstiltskin, so I was curious about why the author was fascinated with the story. She noted that the original story bothered her for its lack of justice: the greedy father and tyrant king go unpunished while the miller daughter betrays the creature who helped her by magic. Further, she writes that the heroine has no name in a tale about the importance of names. I’m glad I read her ideas about the original story first because I immediately loved the heroine, knowing she was out to do what was right and just. The character names were used to their fullest. And, the story used magic for a defined purpose. It all wove together beautifully, as I would expect a story about cloth-makers to do. I had a push and pull with this book about it being categorized as YA.It was at once a story about a young woman in a man’s world, struggling to know the significance of her very name (classic YA “who am I” theme) while also a story of woman in need of saving her child and discovering the emotional bonds of marriage (the first time I ever saw that in YA and never expecting to). I have a personal theory, which I could probably never prove, that is there are just as many adults reading YA books as there are young adults (14-20 let’s say). And, I’m impressed at the way this book might reach both audiences. If I were still in Education, I’d want this book on a reading list. If I were in a book club, I’d also recommend this book. I picked it up not only because I’m always trying to study how this particular editor works, (I really like Arthur A. Levine Books) but also because it won the Morris Award, given annually to a debut YA author for outstanding work and promising voice. I’m just beginning to explore this list of award-winners because it’s only been around since 2009. 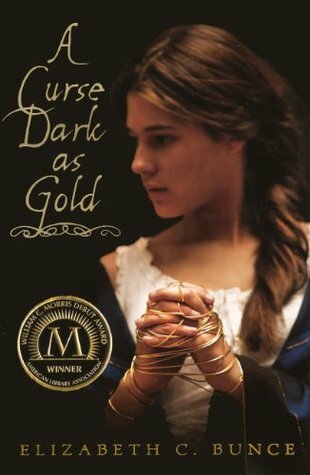 A Curse Dark as Gold was the first recipient of the award. I really enjoyed this too though it took me a bit to get into it. I was surprised that there was so much internal thought at the beginning after my critique with Cheryl Klein but maybe it was needed for that book and not my manuscript in her eyes. I really want to read more by Elizabeth Bunce.